The theoretical physicist Hannah Petersen has been awarded the Zimanyi Medal of the Hungarian Academy of Sciences. The award is in honor of her work on relativistic heavy ion collisions. This young researcher has been the leader of a Helmholtz Young Investigators Group at GSI Helmholtzzentrum für Schwerionenforschung since 2012 and is a professor teaching at the Goethe University in Frankfurt. Her studies are important for the work on the future accelerator center FAIR, which is currently being constructed at GSI. 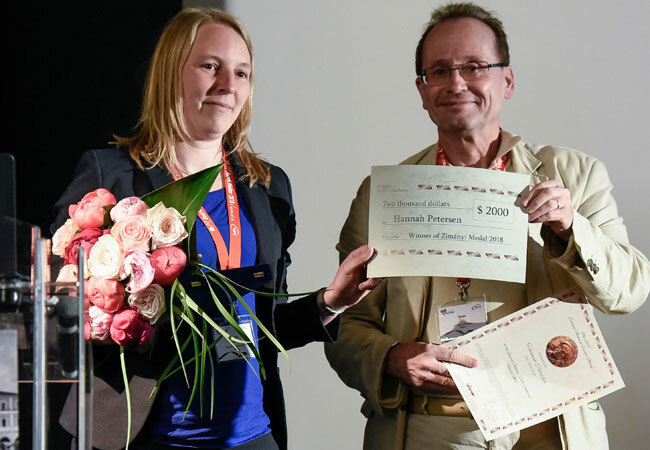 Prof. Petersen received the award at the Quark Matter Conference in Venice, where she also presented the latest results from her working group. The quark matter conference is the largest conference in this field with over 800 participants. Hannah Petersen is the youngest member of the International Advisory committee of the Quark Matter Conference. She is working on new theoretical descriptions of the state of matter shortly after the Big Bang. Relativistic heavy ion collisions offer a way to study strongly interacting matter under the extreme conditions that prevailed at that time. “By accelerating lead or gold nuclei to almost the speed of light and smashing them together, we can reach temperatures and densities that existed in the early universe only microseconds after the Big Bang,” she says to describe her research. At such high energy densities, the basic theory of strong interaction, the quantum chromodynamics, predicts the existence of a new phase of matter—the quark-gluon plasma—which expands explosively at extremely high pressure. Prof. Petersen was one of the first to recognize and investigate how the course of this explosion was affected by density and temperature variations resulting from quantum effects. By comparing theoretical and experimental data she was able to propose a frequently cited hybrid model that illustrates the dynamics and viscosity of the plasma as a function of the respective initial state of the quantum fluctuation. The future accelerator center FAIR will provide the researchers with conditions that otherwise only exist in outer space. The work of Prof. Petersen and her Young Investigators Group is an important element for drawing essential conclusions from the experiments. Her main goal is to develop a transport approach for the dynamical description of heavy ion reactions at FAIR using state-of-the-art scientific computing. The scientific managing director of GSI and FAIR, Prof. Paolo Giubellino, is delighted about the young physicist’s award. “Hannah Petersen’s analytical method lays an important new foundation for experimental measurements at FAIR. Her work has now been rightly honored with the highest award for young theoretical physicists in the area of heavy ion physics,” he said. The Zimanyi Medal is awarded by the Wigner Research Center for Physics of the Hungarian Academy of Sciences in Budapest. The prize was created in memory of the nuclear physicist József Zimányi, who died in 2006. Zimányi was also a member of the Hungarian Academy of Sciences and a professor at the Institute for Particle and Nuclear Physics (RMKI). The medal is awarded to theoretical physicists under the age of 40 years who have achieved important international recognition and impact in the area of theoretical high-energy physics.